Speed is of the essence in the esoteric and wonderful world of flight case manufacturing. The method by which the wheel is attached to the case is pivotal to the whole process … so flight case accessory specialist Penn Elcom has designed and machined two ingenious new solutions to make this quick and straightforward. Penn presents its brand-new Castor Plate series (W0098-FM) offering some truly revolutionary features to speed up the fitting of wheels. ‘Wheeling’ a flight case typically consists of fitting a board, 4 plates, 16 screws and 16 nuts – and is an arduous and time-consuming task. It offers two practical solutions – with the choice of either a top-down or a bottom-up style which come with bolts or nuts already attached respectively, so the case builder can choose to suit the case design and application! The new Penn Castor Plate is made from Zintec and weighs just 187 grammes. It has a sleek and streamlined appearance and removes the need for heavy wooden caster boards when building flight cases … significantly reducing the weight of the overall case. The wheels bolt directly through the flight case panel utilising the Castor Plate’s integrated threads, so there is also no need to use T-nuts. Quicker, less fiddly and more secure. Both these key features reduce the overall costs of building flightcases and speed up the fixing time. The new system is robust and ideal for automated production of any type or style of flightcase. Penn offers a complete Castor Plate Kit (W9970-KIT) containing everything needed for efficient and cost-effective flight-case wheel assembly. 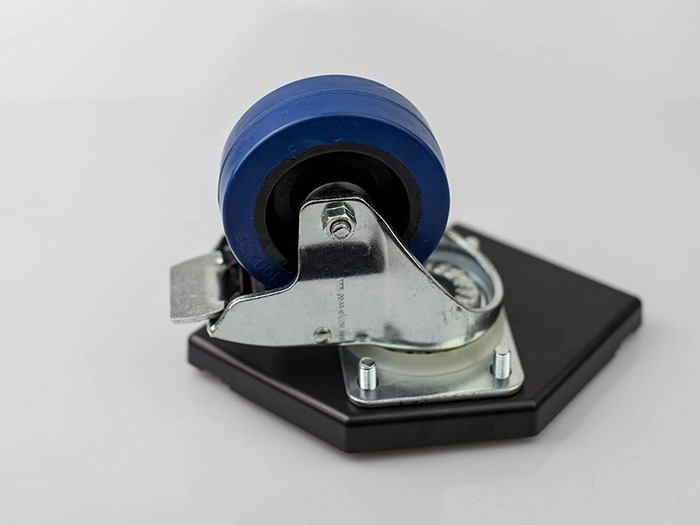 The kit comes with universal wheel plates, and the current product is suitable for use with 100mm / 4-inch castors, one of the most popular sizes. This has been developed to meet the increasing demand for quality flightcase materials, from both rental and production companies with their own in-house flightcase facilities and specialist case manufacturers. The neat and nifty Castor Plate allows machining to be optimised and a reduction in the weight of the finished flightcase in addition to accelerating the build process. Penn has been manufacturing high-quality flightcase components and accessories since the 1970s and has a reputation for invention and trailblazing. The Castor Plates are the first in a series of reinventions for the worlds of entertainment, leisure and commercial technology where good flight-casing is essential.